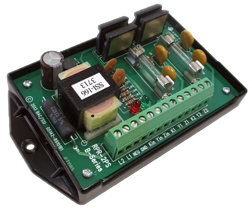 This month we are featuring one of our most popular products, the RPR-2PS Repeating Pulse Relay. What makes this product so popular you might ask? Well beyond the fact that the RPR-2PS is designed with superior solid state relays, it is also the most widely used product for various applications. The RPR-2PS is designed to provide two isolated solid state Form C (K, Y, & Z) contacts from a single Form C input. It filters noise and transients from its input to prevent any false pulses at its output. Many of our customers find the RPR-2PS’ most valuable feature to be its universal power supply input that ranges from 90 to 300VAC. Worried about damage? Don’t be. The “K” lead of the RPR-2PS’ output is fused to prevent damage to the relay under almost any condition a user might cause such as excessive current, incorrect wiring, etc. It also includes a robust solid state switching device that is rated at 800V and 750mA resulting in maximum protection from lighting or transient voltage damage. The RPR-2PS is mounted on a base plate made of polycarbonate offering excellent electrical insulation between the circuit and the mounting surface. With protection like this the RPR-2PS is almost indestructible! No wonder the RPR-2PS continues to be in such high demand with these incredible features! For a customer to use pulses for demand, a demand monitor such as Brayden Automation’s Model 9321, or a demand controller such as Models 9388B and 9388C are required. These continually monitor the incoming pulses, time them, and automatically calculate the instantaneous demand of the building. The instantaneous demand is then averaged over the same demand interval that the electric meter is using to calculate demand for an accurate real-time display of the average KW demand.